Improve fine motor and design copy skills with this set of colorful, flexible strips of plastic that all snap together at different points. 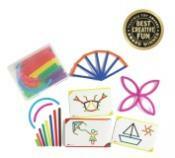 Set includes 200 highly durable stixs in 10 lengths, ¼ and ½ circle pieces, and 30 beautifully illustrated double-sided activity cards, (includes cards for all upper case letters). Very successful as freeplay, creative thinking materials for small groups.